While reviewing these features, please understand that ALL printed parts are made by an Airwolf 3D printer. Every printed part described herein is completely reproducible by you at home. Furthermore, these parts don’t take days to print. 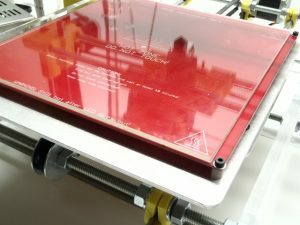 Most parts can be printed accurately in less than an hour, with no need for any further “calibrations” or firmware tweaking. Furthermore, the STLs and gcodes for these printed parts are included with your purchase of an AW3D v.5. Enhanced acrylic frame is thicker than standard (at 3/8”) for better stability and less vibration. Frame openings have been modified for increased build height up to approximately 4.5.” The design allows easy access to the critical components of the Airwolf 3D printer such that parts can easily be replaced, adjusted, and modified as necessary. 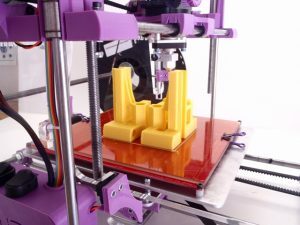 The design was derived from the Prusa Air 2. See http://www.thingiverse.com/thing:14204 and from Prusa’s improved version of the Mendel. The Y Axis motor mount was developed to reduce the need for the extra bearing in the standard Prusa design and to eliminate the source of excessive belt flapping. The beefy design also eliminates the need to provide further support to the Y motor to prevent flexing (no more zip ties). Derived from http://www.thingiverse.com/thing:15991. 6T2 belts and gears are incorporated for improved linear movement and accuracy. 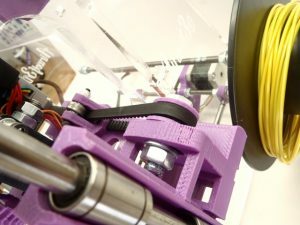 All gears are printed on an Airwolf 3D printer. With the high quality belts, there is less need to re-tension and the small teeth provide more accuracy and less chance of skipping steps. Gears were derived from http://www.thingiverse.com/thing:16627. Custom lightened upper aluminum upper plate does not warp like acrylic. 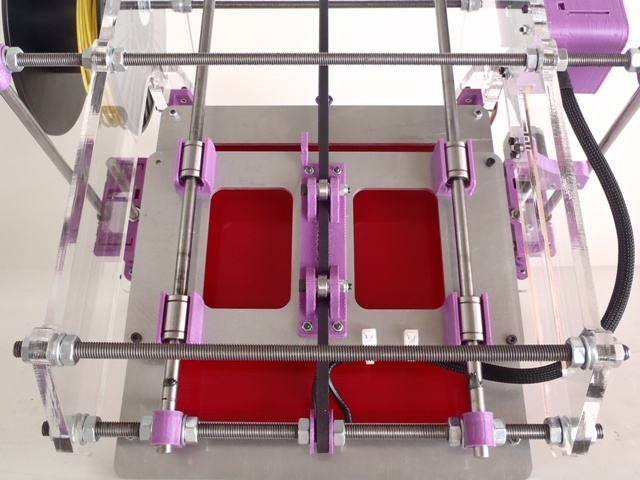 With this print platform, print height remains consistent and reduces the need to “relevel” the bed. Light weight also lessens stress on the stepper motor and permits faster print speeds. Finally, aluminum is less susceptible to bending than acrylic – with or without heat. Similarly, custom lightened lower aluminum upper plate does not warp like acrylic while also providing more print volume in the y direction. The Y Axis incorporates two idler bearings to keep the belt from flapping up and down. 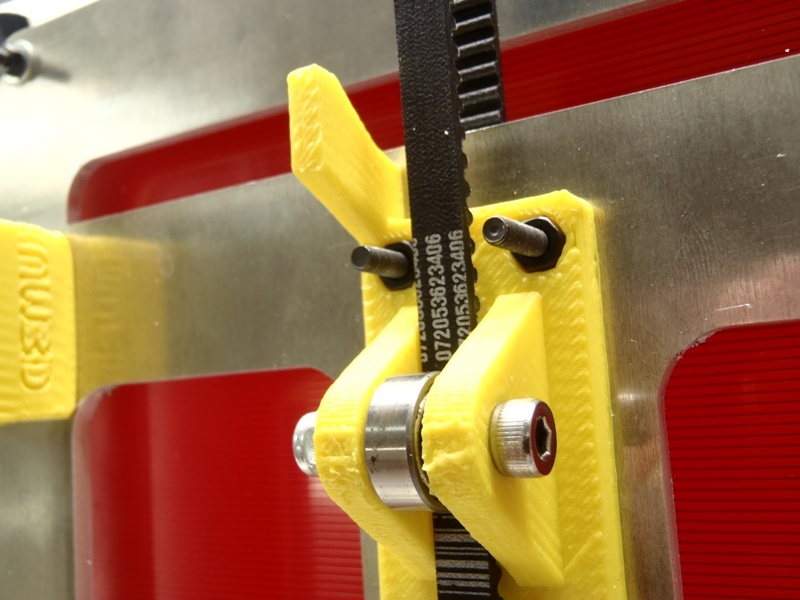 With the tensioners, you can run less tension on the belts without worrying about skipping steps. Less tension, means less stress on the belts, bearings, and plastic components of the machine, increasing reliability and repeatability. Combined with the GT2 belts and pulleys, the design is virtually bullet-proof. The LM8UU bearings are kept tight in the bearing keepers without the need for additional fasteners. The keepers can be removed from the top with just an allen wrench as the nuts are sunk into the keepers. No more flimsy tin! 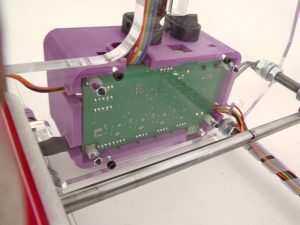 The Y Axis incorporates a printed flag that interfaces with a microswitch integrated into the Y axis motor mount. This is a bullet-proof design that requires no further “adjustment.” The components are kept out of sight and out of the way of accidental damage when working on the machine. The bed has been designed to permit quick and reliable height adjustment from above. Leveling the bed is simply a matter of adjusting two bolts that are readily accessible. With the rigid aluminum bed components and precise acrylic frame, leveling is much more infrequent than conventional 3D printers. 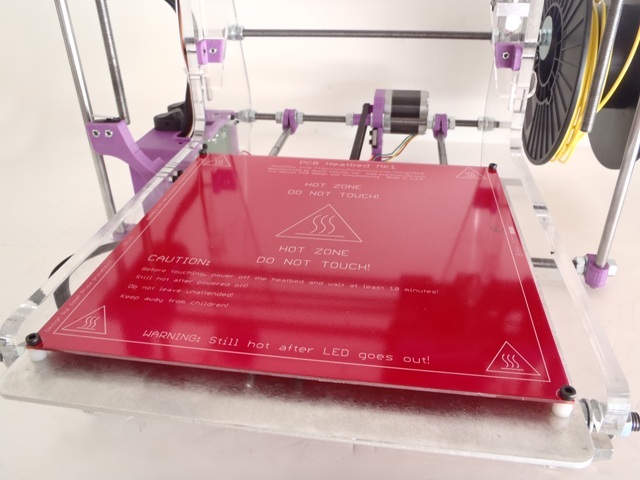 Further, the borosilicate glass is the perfect 3D printing surface because it is essentially perfectly flat. The glass is also rated for higher temperatures than normal sheet glass, making it a better material for use as a heated bed. When covered in PET tape and lightly coated with a mixture of acetone and ABS, there is no better surface to print ABS on. No more zip ties or nuts and bolts to hold the LM8UU bearings in the X brackets. 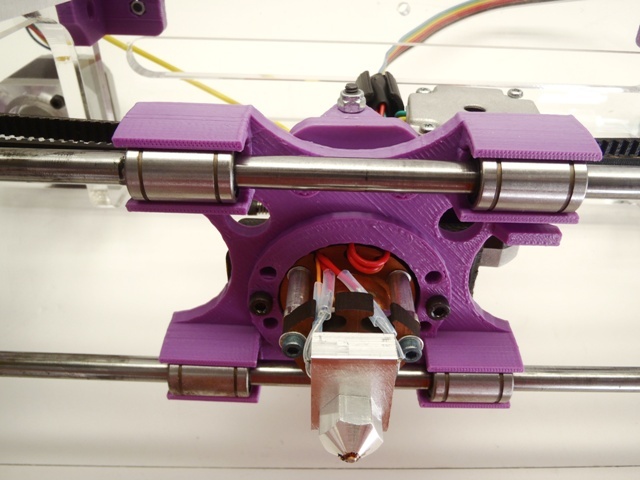 These parts started as the Prusa X brackets and then were heavily modified to accurately hold the LM8UU bearings in without the need for additional unsightly fasteners. Further, there is no more need to tension the belts by adjusting the belt connection on the X carriage. Here, the right side X bracket is beefed up and slotted to permit quick tensioning without the need for disassembly. We also increased the height of the X brackets to locate the upper bearings approximately one inch higher to provide more vertical rigidity to the brackets. Derived from http://www.thingiverse.com/thing:9936. Opto end stops are a practical nightmare if you want to dissemble or otherwise work on your machine. The wire connections are fragile and once a wire is broken it is almost impossible to the repair the Opto sensor. AW3D v.5 incorporates built-in mechanical end stops for the X, Y, and Z axis to enhance durability and ease serviceability. 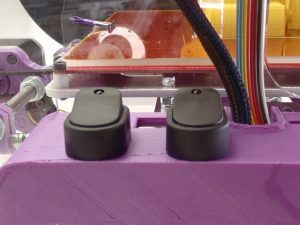 In the X and Y axis, the mechanical endstops are actually integrated into the parts, eliminated accidental “nudging” that can ruin adjustments and foul wired connections. These directional gears mesh perfectly together. 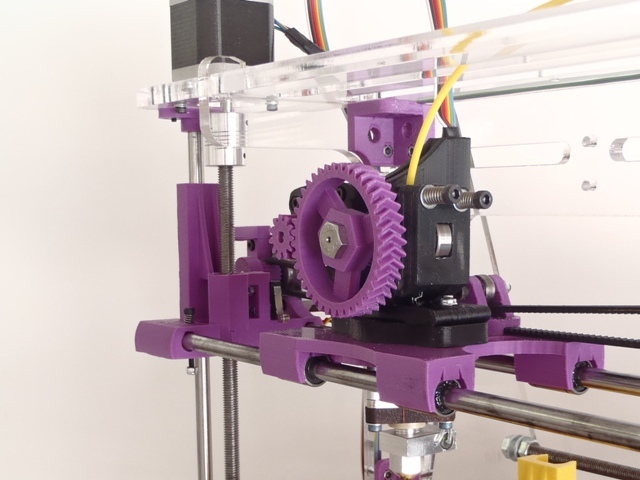 There is a big, big difference between a 3D printer using these gears and conventional gears. If you watch the Airwolf 3D in action, you will notice that the motor is frequently spinning the gears back and forth to optimize plastic flow and prevent ooze. You simply cannot print like this with the slop present in conventional gears. 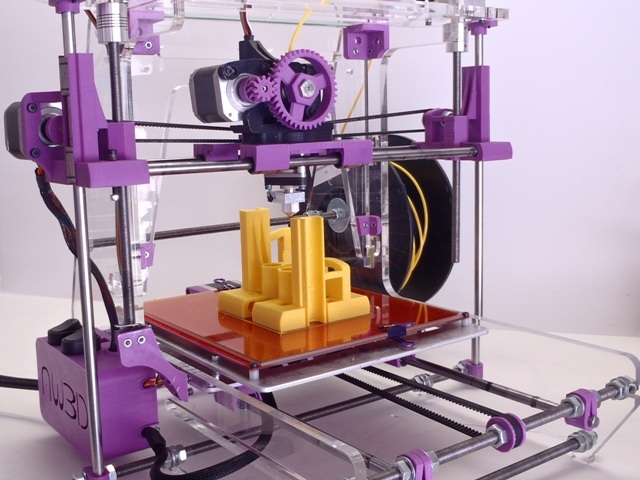 Of course, AW3D v.5 effortlessly 3D prints these gears out, accurately and timely. These gears were derived from http://www.thingiverse.com/thing:19227. As with the X Brackets, the X Carriage has been painstakingly developed to eliminate the need for fasteners while also providing strong bearing retention. Additionally, the 4-bearing design eliminates the unnecessary flex that can occur from the 3-bearing design. Finally, we increased the spacing on the rods by a little less than one inch to provide more stability to the X axis. 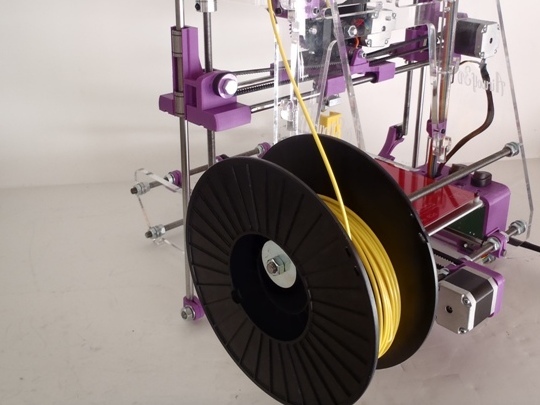 Prints to your heart’s desire with economical filament. 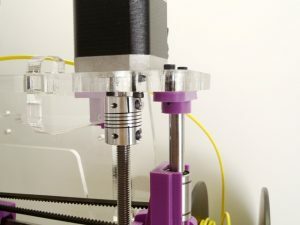 Custom-derived extruder originated with http://www.thingiverse.com/thing:18379 and was modified for the gear set and to maximize X travel while still providing accessibility. Spring-loaded height-adjusting bolt makes height adjustment quick and painless. 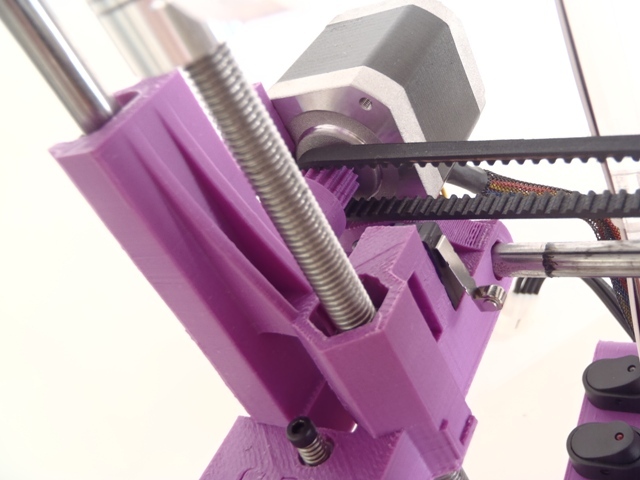 Simply dial in a quarter turn or so on the 2.5mm allen to quickly adjust print height. There is simply no easier way to adjust the height of the print. These couplings minimize “wobble” on the Z axis and account for any imperfections in the Z axis rods. They are absolutely necessary for accurate 3D printing. 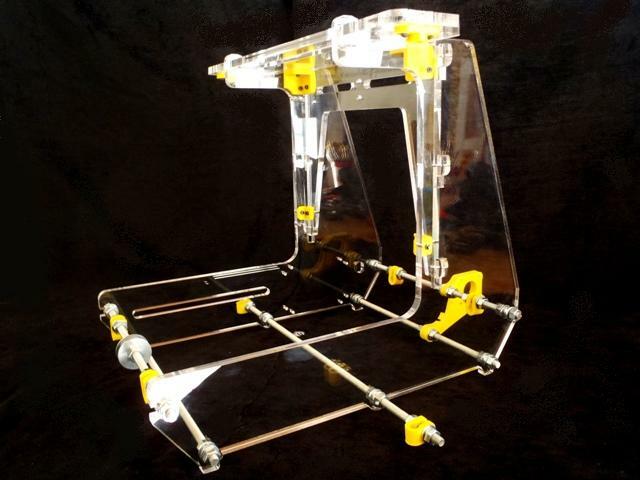 Lightweight and reliable bed by Prusa for quick heat up and even heat distribution. See http://www.thingiverse.com/thing:3919. The separate switches eliminate the hassles of plugging and unplugging the power wires. Moreover, separate circuits and wiring are provided for the Gen 6 circuit board and the MK1 heated bed. 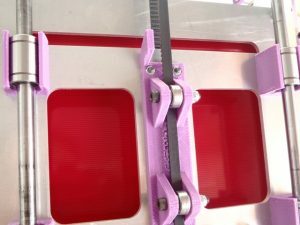 Because the heated bed pulls substantial current, heavy duty wiring is used for this component of the machine, to avoid overheating and to enable the heated board to stay hot to prevent curl-up of the printed parts. Spool holder rod is securely installed and includes bearings to ensure smooth and easy distribution of filament as the 3D printer needs. 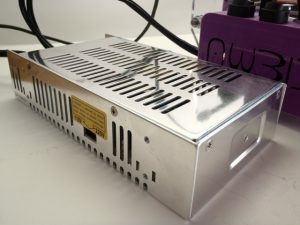 This 12vDC Switching Power Supply is durable and, unlike other PC-based power supplies, capable of supplying more than enough power for the printer, most of which is consumed by the Mk1 heated bed. 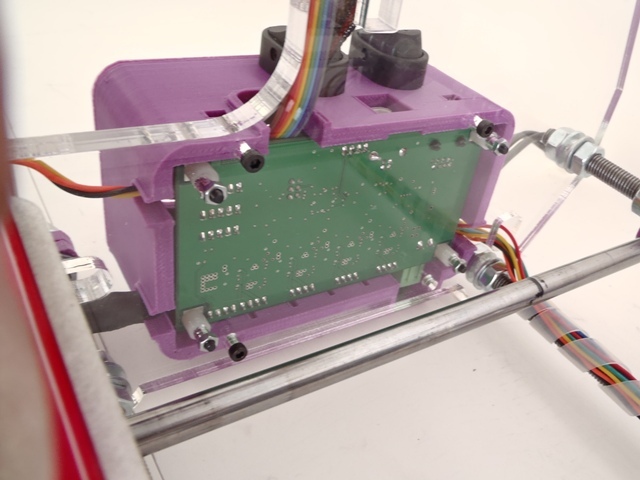 Without the proper current (and wiring), ABS parts will simply not stick to the printing surface. Those worries are put to rest with this power supply. Sophisticated, modern, and reliable control over the printer. 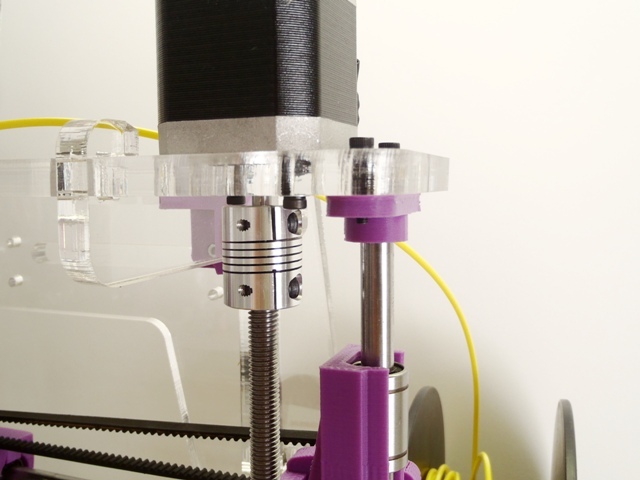 Derived from the very strong Lulzbot Buda Hotend, we’ve made several tweaks to increase durability. Nozzle can be swapped out for a .35mm version for more precise printing. 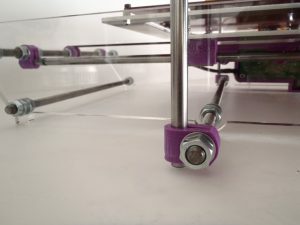 For the most accurate prints, you must use metric rods for the Z axis. 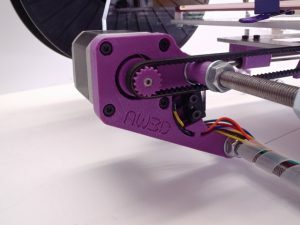 The Airwolf 3D uses metric threaded rods for the Z axis. The firmware is perfectly calibrated to use these precise threaded rods. Metric rods are a must for smooth printing when using LM8UU bearings. 5/16″ rods simply have too much play for precise prints. 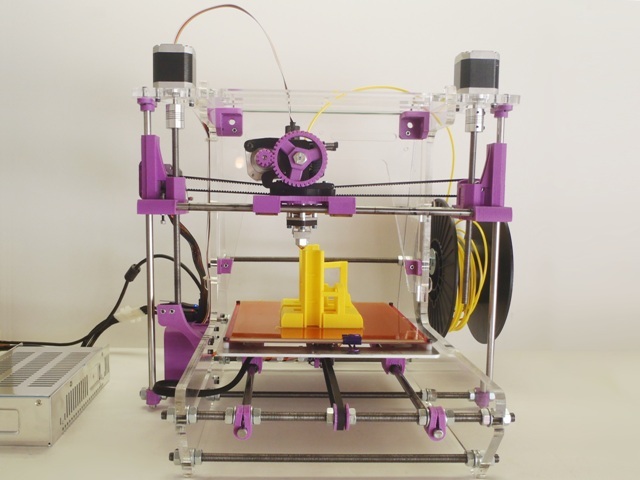 The Airwolf 3D printer incorporates top-quality 8mm rods for quick and precise 3D prints. Most advanced and tweakable firmware available. Perfectly calibrated for the Airwolf 3D printer to allow fast printing, but avoid skipping. Of course it includes acceleration and deceleration for optimal performance. Easy to recompile and reconfigure with Arduino. See https://github.com/repetier/Repetier-Firmware. 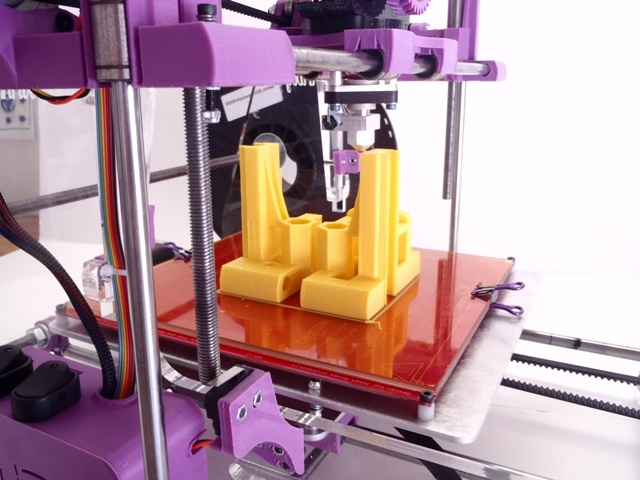 These bearings allow more precise and faster prints over conventional PLA bushings. High-quality, high-torque stepper motors for high performance and reliability. Open source Reprap community design allows you to easily upgraded and modify your 3D printer to the fullest extent of your imagination. See http://reprap.org/wiki/Main_Page. 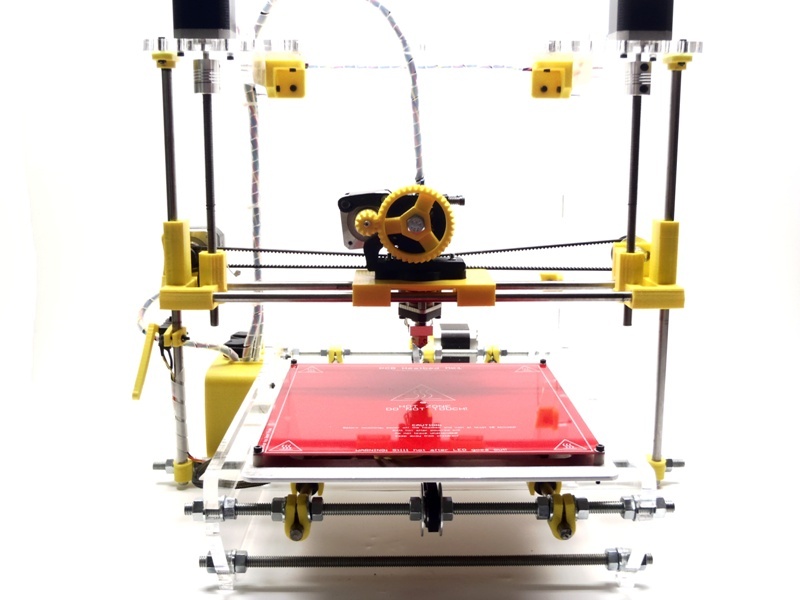 All parts and designs for the Airwolf 3D printer will soon be available on our website and are continuously being upgraded. 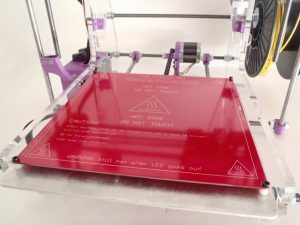 Translation: once you buy the Airwolf 3D, you can quickly update to the latest part designs by simply downloading and printing out the STLs made available on the website or delivered upon purchase of an Airwolf 3D printer. 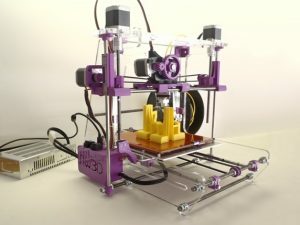 This entry was posted in Featured, Features and tagged Prusa, Prusa Air 2, REPETIER FIRMWARE, REPRAp, Reprap community, SELF REPLICATING, sTEPPER MOTORS.